This is going to become a multiple part post. I have three different age groups (technically four, but the great part of homeschooling is that I can put my girls in the same grade.) so I think to save you from reading a novel about homeschooling I’ll break it down.This post let’s focus on the Pre-K kid in my life. I’ve had a lot of people ask what curriculum I recommend or will be using for Anne, my four year old. I actually taught fours at a preschool program locally here, so I do have some good insight into this age. Gasp! What?? Yes, you heard me. Nothing. I’m not grabbing a curriculum that is structured or scheduled. So much of their lives are handled in the structured, scheduled, and dictated way when they get older. Let them be little for just a little longer. reading books from the library!!! The last one is probably the most important. The truth is that children, especially younger siblings, learn from so much more than we realize. They learn from exploring, and touching, and asking one million questions. They learn from seeing and experiencing things. I don’t have any doubts that she is already picking up on stuff now as we do school during the day. One thing that I do know though is that if she is not busy, she is up in my business. So I created for her some school activity bins. They also could be called busy boxes, but mine usually have some educational purpose. Pinterest is a wonderful resource of ideas. My Pre-k board is here if you are interested in some of my finds! Most people are on the Amazon band wagon, but I feel like there is still so much to be explored. I utilize Amazon for most of my shopping these days and when preparing for homeschool it was no different. 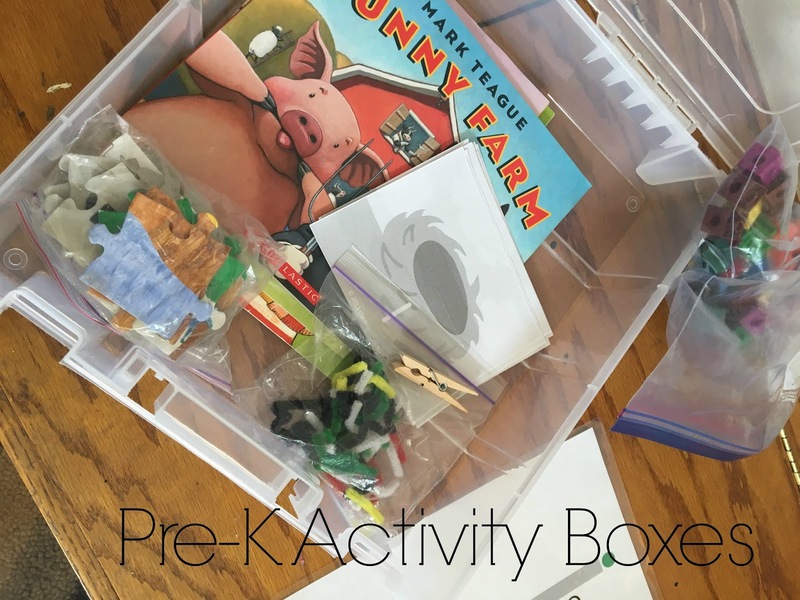 Many of the items I have in my activity bins are either from Target dollar spot, or Amazon. We both know what will happen if we step foot into Target. Let’s not talk about it though. 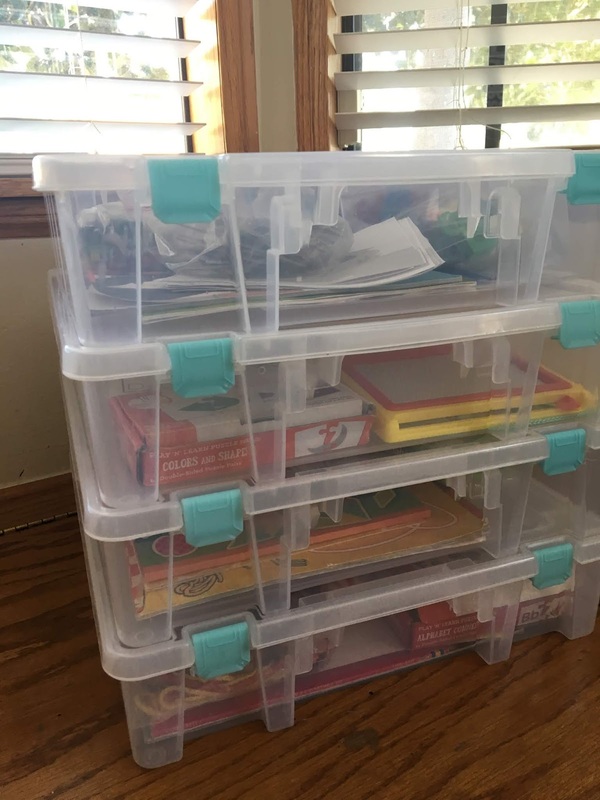 I’ve gone ahead and created a list of resources found on Amazon that I really love for her school boxes. My hope and goal is to also create lists for each grade that I’m teaching. The boxes I chose were at Walmart, I actually wish I had gotten the ones I found on Amazon. My Walmart ones have broken down quite a bit already. My requirements for the boxes were: stack flat, fit paper flat, and be big enough to put actual activities in if I wanted. I have four, because we only school four days a week, Friday’s are for cleaning, fun and friends. I put them under our school central desk and she can grab the one she wants and go find a spot to play! 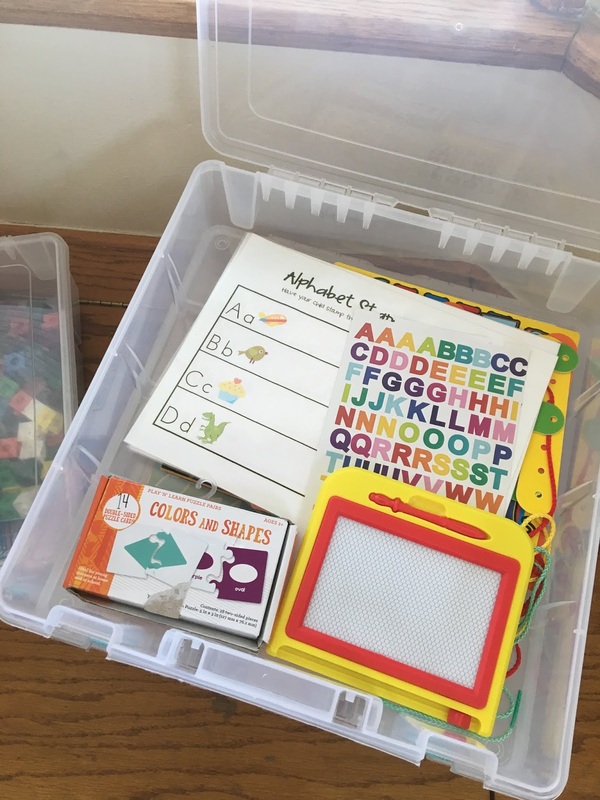 Flash cards are great, simple and easy to put into her boxes. I like to have a variety of them so that there is one in every box. Everything in the box needs to be something she can do on her own, which may make you pause and say, why did you put Go Fish in her box? Matching uppers and lowers my friend. 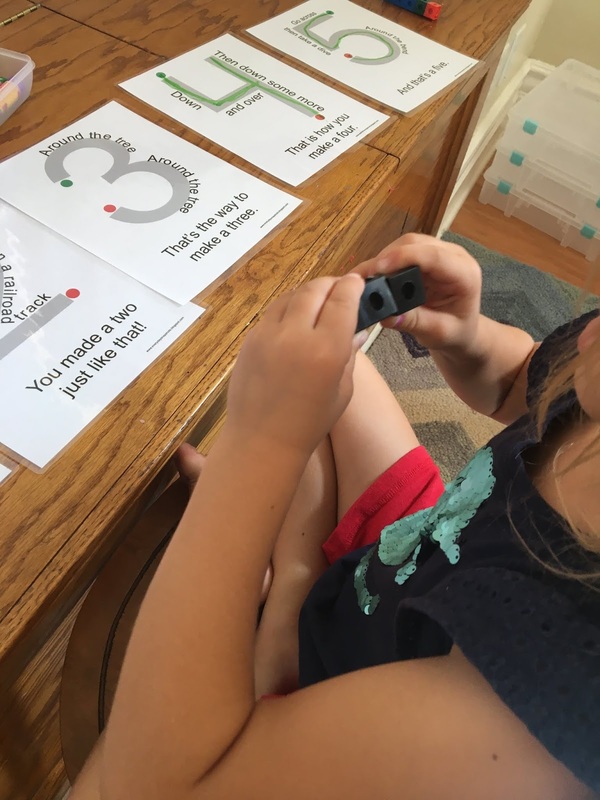 Great for letter recognition and letter/sound association. Because the box is big enough I do have a few games or activities to throw in there. I don’t work for Learning Journey or Learning Resources, but wish I did. I love their products!!! You’ll find a lot of them on my list on Amazon, which you can find here. Their rainbow letter popsicles have lasted soooooooo long in this family. Which is saying something about their product because my kids are not easy on toys. As I said before there are a lot of resources on Pinterest and whenever I’ve found some consumables, or printable’s I like for her I usually laminate them. That way I’m saving paper (and trees if you are into that) and they can be used over and over. This is the one that I have and I’ve used for years. If you are homeschooling, or have littles not yet school age these are great resources for some quiet time! 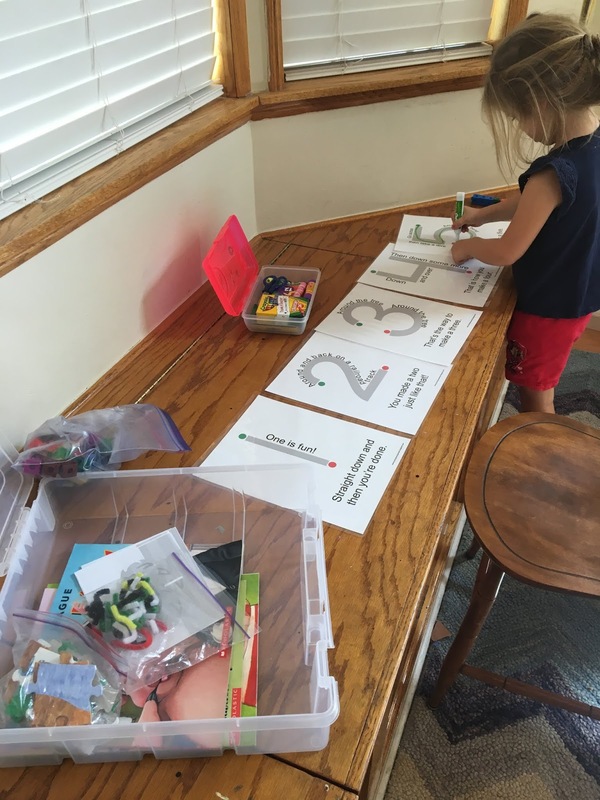 Do you do activity or busy boxes for your littles? If so, comment some of your favorite resources and ideas!! Affiliate Disclaimer: Yes, those are affiliate links. Four kids is expensive you guys! If you click it and end up buying it I get “mama needs coffee money.” Not enough for “Mama needs some wine and a vacation,” but still. I wouldn’t recommend something that wasn’t a good product at a good deal, not only would my grandmother turn in her grave, but that’s not what friends do. Happy shopping friends! Next To the Mom Who Doesn’t Feel Like “Cherishing” the Hard Moments Right Now.